614 CROISSANT, Peter 5 Aug 1858 Rohrbach, Russia 1 Feb 1943 Johnstown, Weld,Col. 1233 CROISSANT, Henry 3 Mar 1896 Soloternoka, Russia 18 Nov 1988 Orange Co.,Calif. 612 CROISSANT, John 7 Sep 1854 Rohrbach, Russia 19 Aug 1926 Buckingham, Weld,Col. Stated Destination - Loveland, Colorado. Built by J.C. Tecklenborg, Geestemunde, Germany, 1899. 7,409 gross tons; 429 (bp) feet long; 54 feet wide. Steam triple expansion engines, twin screw. Service speed 13 knots. 1,970 passengers (120 second class, 1,850 third class). 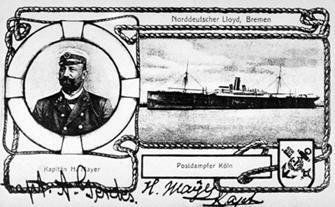 Built for North German Lloyd, German flag, in 1899 and named Koln. Various, including Bremerhaven-New York service. Laid up at Boston 1914-17. Seized by United States Government, American flag, in 1917 and renamed USS Amphion. Scrapped in 1923.